Cutting boards don’t need to be complicated: big, preferably wooden thing that you can chop on. Simple. But despite the flawless logic above, I still want this ludicrously expensive bells-and-whistles cutting station. First, let’s get this out of the way: $165 is an absurd amount of money to spend on a thing that you’re just going to stab with knives, even if those are fake Canadian dollars you’re spending. However, the modestly-named “ULTIMATE CUTTING BOARD” actually goes a long way to justifying its ultimate price tag. The board is big, generously thick, and made of maple. It splits into two pieces to work as serving platters, with magnets keeping the halves in place when you want to use it as a board. 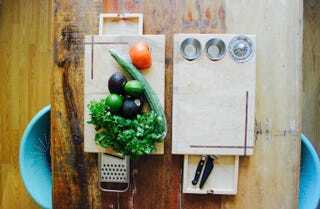 More interestingly, it has a bunch of common kitchen tools built in: You’ve got a cute little citrus juicer, bowls for your finely chopped onion, and a grater stowed in the board. There’s also a little drawer for storing anything else you’d like to keep to hand. I know what you’re thinking: None of this can justify spending that much on a single chopping board. And to be honest, you’re right. It’s a doubly stupid purchase because it’s a Kickstarter project, so you’d be dumping $112 US in order to maybe get an expensive cutting board in April, maybe. But still: juicing a lemon while cutting your onion? The future is truly here.